What is the Partnering for Safety Approach? The “Partnering for Safety” approach is a collaborative, safety-focused and family-centred approach to child protection assessment and planning. The “Partnering for Safety” approach (PFS) is a comprehensive practice approach that draws on evidence-based and innovative methodologies and tools from around the world, including Solution-Focused Brief Therapy, Narrative Therapy, Strengths-Based practice, Family-Centred practice, the Signs of Safety Approach, the Resolutions Approach, the “Three Houses” Information Gathering Tool, the “Slapende Honden? Wakker maken!” Stabilisation Method, the Safe and Together Model, Response-Based Practice, Motivational Interviewing, Family Group Decision-Making, Appreciative Inquiry and the latest thinking from Implementation Science. The name "Partnering for Safety" was coined by Sonja Parker and Philip Decter to describe this integrated approach, which is being developed by a number of experienced child protection practitioners and innovators from around the world. Working with Phil Decter in Brisbane. The "Partnering for Safety" approach also integrates the use of Structured Decision Making® (SDM) tools, which have been developed by the Children's Research Center. Structured Decision Making® tools bring the best of child protection research and aggregate data into tools that can be used by caseworkers to ‘check’ their thinking and intuition at key decision-making points to ensure these immensely important decisions are consistent and congruent with research, best practice and organisational policy. The “Partnering for Safety” approach is designed to help all the key stakeholders involved with a child - the parents, the extended family, the child protection worker, supervisors and managers, lawyers, judges and other court officials, even the child him/herself – to keep a clear focus on assessing and enhancing child safety at all points in the child protection process. It is organised around a collaborative assessment and planning framework that is developed collaboratively with children, families and their networks. This collaborative assessment process provides the focus for the family, professionals and safety and support network to then work together to develop and implement detailed safety plans that describe the day-to-day changes that families and their networks will put in place to ensure the enduring safety and wellbeing of the children. 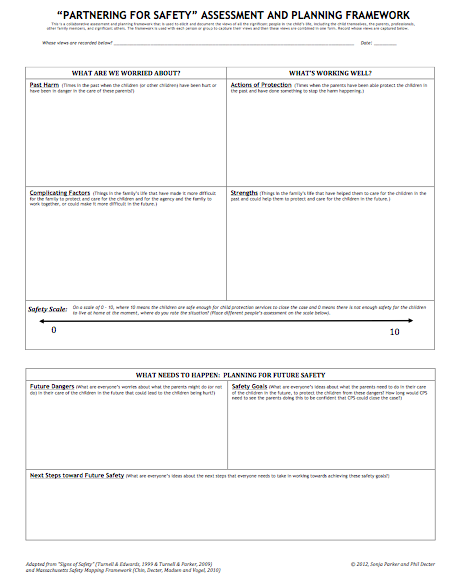 “Partnering for Safety” incorporates an approach to ongoing learning and development that focuses on the latest learning from implementation science, and that emphasizes the importance of action learning, reflective practice, appreciative inquiry and quality supervision to support skill development and to elicit and deepen good practice. This page has attempted to describe the principles, components and tools used in the "Partnering for Safety" approach to child protection casework. While PFS draws on a number of recent approaches to child protection work and to work with families, the spirit of the information presented above is as old as social work itself. Much of the principals, practices and approach described here could be understood as an invitation to return child protection practice to the ‘heart of good social work’ – collaboration, transparency, respect and rigor in the work. The "Partnering for Safety" approach will continue to grow and develop. We welcome your feedback, ideas, and contribution to deepening this practice. The CAP framework has been adapted from the Signs of Safety framework (Turnell & Edwards, 1999; Turnell & Parker, 2009) and the Massachusetts Safety Mapping Framework (Chin, Decter, Madsen and Vogel, 2010).